You’re faced with an immense challenge. Your professor asked you to write an essay, which will be very important for the final grade you’re going to get. Maybe you’ve tried to write few essays before and your attempts were not very successful. Maybe this is your first time writing such a project. In both cases, you have one main goal: get better at academic writing and produce a memorable paper. One aspect is particularly important for achieving that goal: you need to outline essay before you start writing it. The college essay outline is the skeleton of your essay. When you know how to develop a proper essay outline, you’ll know how to write the essay. Why Is the Outline for Essay So Important? The outline keeps you focused. It gives you a direction to follow, so you will refrain yourself from making digressions while writing. The outline alleviates the frustration. When you’re faced with an essay, you don’t know where to begin. The outline gives you a place to begin. It helps you organize your thoughts and ideas in a readable format. The outline makes the writing process way easier. You’ll already have the skeleton of the paper, so you’ll only need to fill in the blanks. So yes; the outline is really important. The only question at this point is: how to write an outline for an essay? First of all, you have to understand the assignment. Then, you should define your main points. Only then you’ll be ready outline essay. The first step of the process is understanding what type of essay you’re about to write. Usually, college professors assign the five-paragraph essay format. It’s a standard assignment that gives you just enough space to expose your arguments without getting boring. It’s also a nice structure that helps you maintain the paper’s logical flow. Introduction In the introductory paragraph, you’ll explain why this particular topic is important. You’ll give some background on the matter, and you’ll finish the paragraph with the thesis statement. Body The body is usually consisted of three paragraphs. Each of these paragraphs has a topic sentence, which argues the thesis statement. Conclusion The conclusion restates the main points and shows how they proved the thesis statement. Although you won’t write your essay in a table, it’s okay to use the table for your essay outline format. It will give you a structured format that helps you organize your thoughts. Your professor gave you instructions for this paper. They set some expectations, so you have goals to meet. That’s why the process of preparation is crucial. Read the instructions very carefully. Make sure you understand them. If you don’t understand something, discuss the issue with your classmates or simply ask your professor. Most professors are willing to answer questions and clarify the assignments if you ask very specific questions. You’re not writing an outline for essay; you’re writing an outline for a particular essay with a unique topic. This means that you have to find that topic before you start developing the outline. Start with brainstorming! Without conducting preliminary research, think of everything you know about the general theme that your professor provided for this essay. If, for example, you’re supposed to write an essay about the relationships between people and animals, write all ideas that come to your mind. You know that people keep dogs and cats as pets, so write that. Write any association you have for this topic. This brainstorming process will guide you to ideas that inspire you to write the paper. Pick the most inspiring idea. Then, search for some interesting aspects related to it. If, for example, you want to explore the relationship between people and dogs, you’ll easily find interesting facts through Google. We Love Our Dogs, But Keeping Them as Pets Might Not Be the Most Ethical Thing to Do. Now that seems like an interesting topic. Why? – Because it’s surprising and unexpected. It’s not something that most people are aware of. This kind of topic also gives you a lot of space for discussion, as well as opposing opinions that demand you to defend your thesis statement. That’s the kind of topic that would be perfect for the development of a great college essay outline. Most students think they should write the outline before they start composing the thesis statement and the main arguments. You could do that, but the approach would leave you with a dry outline like the one in the table above. That doesn’t make your work easier at all. If you want a really effective essay outline format, then you need to think of your main points. The thesis statement is the carrier of the essay. It sets the question that your essay will be answering, and it sets the tone for the discussion. It won’t state your full opinion; you’ll save that for later. It rather identifies the main points you’ll be arguing for or against. When we keep animals as pets, we treat them as commodities, just as we do when we treat them for eating. That could be a good thesis statement for an essay. It gives you room for discussion, but it still sets the tone of the paper. Each body paragraph from the outline should briefly state a main topic sentence. When you start writing the essay, you’ll discuss that topic sentence in the paragraph. The outline for essay should be brief, so you won’t write too much. You’ll just list some evidence and arguments. You may do that in bullet points, so you’ll keep the outline organized. At this point, however, you’ll need to do some research. If this is a personal essay that simply calls for your thoughts and opinions, you may skip the stage of research. If, however, you’re writing an argumentative, cause/effect, expository, or compare/contrast essay, you’ll have to dig through some resources. Don’t worry; a simple essay doesn’t require too much research. Just find strong facts that support your opinions and make sure they come from reliable resources. Journals, books, historical records, articles, interviews, and scientific studies are considered to be authoritative resources in academic writing. Finally, you’ll write ideas for the conclusion, too. So you have your main thesis statement, and you managed to find strong arguments that will support it. Brief history of the relationship between people and dogs. Why do people keep dogs? Thesis statement: When we keep animals as pets, we treat them as commodities, just as we do when we treat them for eating. Topic sentence: The emotional needs of animals are way more complex than most owners assume. Topic sentence: People do not have the right to control every aspect of an animal’s life. Talk about castration, training, living in isolation – most dogs are forced to live a life that their owners create for them. Topic sentence: Animals are sentient beings, so they cannot be our property. Talk about New Zealand’s laws recognizing animals as sentient beings. Talk about euthanizing dogs – it’s not their choice. Talk about selling and abandoning, as if they were our property. Conclusion Restate the thesis statement: As shown through the evidence and arguments presented in the essay, the concept of keeping dogs is much less ethical than most people assume. That’s how a well-organized essay outline format looks like. It already inspired you to write an essay about keeping dogs, didn’t it? That’s the main purpose of an outline: to inspire you to write. It creates the perception that the writing process will be simple, since you’ll only have to expand on the outline. With such a mindset, you’ll be ready to develop the essay without facing any serious obstacles. Your professors and all online writing guides tell you the same thing: it’s important to outline essay before you start writing it! Still, it’s strange to see so many students skipping this step and heading off directly to writing once they do some research. Don’t do that! The outline does take some time, but it also saves you time during the writing stage. In fact, you’ll spend less time on the actual paper if you craft a good outline for it. Don’t forget to keep it flexible. This is not a rigid format that you cannot abandon. If you get different ideas throughout the upcoming stages of the writing process, you’ll just edit the outline to include them. It’s still important to maintain the logical flow, though. 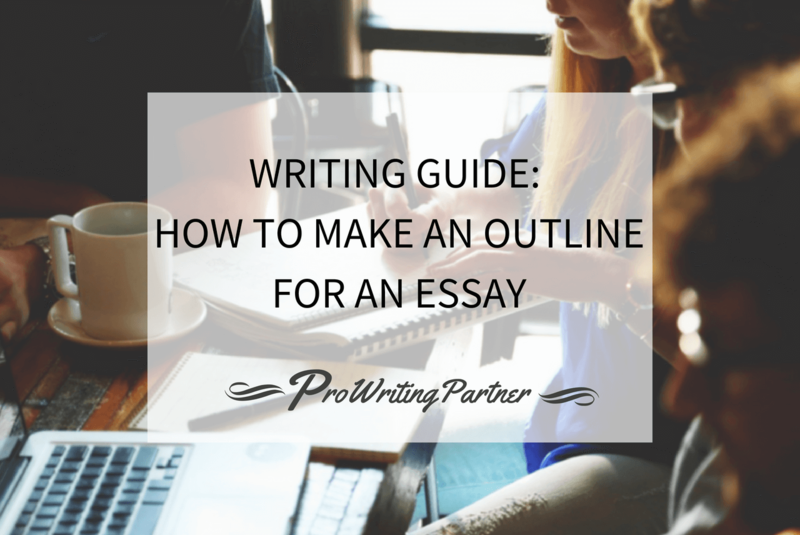 Hopefully, this detailed guide helped you understand how to make an outline for an essay. Now, you’re ready to start!